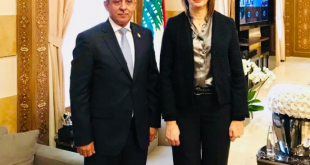 Foreign Minister Khaled al-Yemany met Thursday with U.S. Ambassador to Yemen Mathew Tuller. The session devoted to discuss political process developments in view of Stockholm’s Agreement. Alyemany’s conversations with Tuller also touched upon Houthi rebel militia’s violations and attempts to get around of the implementation of the Agreement. The Minister stated that Sweden Agreement is clear so International Community (IC) should press for putting it in place by pressuring the rebels to do so. Alyemany called on the (IC) to support the Yemeni government’s capacities so that it can re-normalize the situations, reinstate basic services and effectively respond to the humanitarian and development needs. ” This is only way can help managing the humanitarian crisis in Yemen and ensure sustainable solution”, sai Alyemany. For his part, the U.S. diplomat reiterated his administration’s support for the Yemeni government; noting that they are closely watching the situation in the city of Hodediah. He stated that American’s vision is that it is important to enhance the government’s capacities and enable the state’s institutions to function effectively .